I am very fortunate in that from July 2014, I have been able to write full-time. Before that I had the excuse of having to get my proper work out of the way before I could immerse myself in my new novel. Now, of course, I have to find new ways to procrastinate – actually that’s not too hard! My plan is to write two and a bit books a year. So far the ‘bit’ has been editing previously written books, or researching for a new one. The last few books I have written have been serialized: published digitally first in four parts and then as a complete novel some months later. The first of these was Ivy Lane. I wasn’t entirely sure how to go about producing a series, but I wrote a synopsis and had a rough idea of how each part would work out and then set off writing it. Over the last two years, I have honed this process a bit more. I know from experience how to fit enough in to what is effectively a quarter of a novel to hopefully keep the reader interested in the whole series and I develop mini story arcs for each part. I am a very rigid planner. I write detailed synopses and then a bullet point list of the thrust of each chapter. I do as much of my research before I start as possible, particularly the locations. But I am very lax about sticking to the plan. I always remember the email I got from my editor, Harriet Bourton after she’d received the manuscript for The Plumberry School of Comfort Food: Gosh it’s very different from the synopsis, isn’t it? There is that old adage about breaking a large goal into several smaller milestones to make it more attainable and that is how I view my writing. I write part one, shout hurray, have a breather, go back to the plan for the next part to see if it needs adjusting and off I go again. I regularly get stuck. Not writer’s block exactly, but more unsure about the specific detail. For example, yesterday I was writing about a character going to see someone to apologize for her behaviour and I couldn’t decide whether the injured party should be in or not! Luckily my grandmother phoned from her hospital bed and by the time I’d talked through all the possible scenarios to see what would make more sense in the long run, I’d got my answer! I don’t have a specific daily word goal, although I do try and write a complete scene before stopping for the day. My daughters are 14 and 16 and so can go for long spells without needing me and are also very good at interpreting my blank stares when I’m in the middle of something. Even the dog knows when to leave me alone! Cathy's new book, Wickham Hall, is out now! Win! An Afternoon Tea Hamper for Two with Cathy Bramley and Delimann Devon! “As comforting as hot tea and toast made on the Aga!” says Veronica Henry. “As sweet and delicious as scones,” agrees fellow author Michelle Gorman. People are always likening reading Cathy Bramley novels to eating delicious comfort food. This is why we’ve teamed up with the lovely folks at Delimann in Devon to offer one lucky winner an afternoon tea hamper for two to celebrate the paperback release of Wickham Hall by Cathy Bramley. Put your feet up and enjoy freshly baked scones, award-winning jam, handmade fruit cake and more as you read about the adventures of Holly Swift, brand new event coordinator at bustling stately home, Wickham Hall. Wickham Hall by Cathy Bramley is published today! Looking for a light and lovely read to escape the January drudge? May we suggest Wickham Hall by Cathy Bramley? Originally published as a four-part e-serial, the shiny new paperback was published today. As Holly falls in love with the busy world of Wickham Hall – from family weddings to summer festivals, firework displays and Christmas grottos – she also finds a place in her heart for her friendly (if unusual) colleagues. Pop along to wish Cathy a happy publication day on Twitter and Facebook, or visit her website for more information. And stayed tuned for a celebratory competition coming up later today! If you’ve been following Holly Swift’s adventures at Wickham Hall, the beautiful manor home that sits proudly at the heart of the village where she grew up, you’ll be pleased to know that part four is out today. And it’s a festive cracker! Wickham Hall is an utterly feel-good story told in four parts – following Holly Swift’s attempt at organising her own happy-ever-after, one catastrophe at a time. White Christmas is part four. If you’d like to find out more about Cathy Bramley, you can visit her website, follow her on Twitter or pop along to say hello on Facebook. An awful lot has happened for Cathy Bramley in the last two years. Cathy joins us now to talk about how life has changed since she self-published Conditional Love in 2013. Two years, seventeen covers and seven novels later, you can treat yourself to the sparkly, new, made over paperback version of Conditional Love – our Novelicious Book Club pick of the month. I recently celebrated my two-year anniversary in publishing. TWO YEARS! That time has literally flown past; it doesn’t seem five minutes since I was stringing bunting around our local village phone box ready for my first book launch. So much has changed for me since self-publishing my first novel, Conditional Love, and looking back it makes me quite dizzy thinking about how I managed to pack it all in. Things began to change in January 2014, after a call from Transworld to write them a serialised novel and a call from literary agent, Hannah Ferguson, with an offer of representation. I would say that it was a dream come true. Except that it wasn’t really – not the dream part anyway. I prefer to paraphrase Hannibal from The A Team and say that it was a plan that came together. I had decided to self-publish my first book on Amazon and optimistically planned to pitch my second book to an agent. Unbelievably it worked! The second book I wrote will be published by Transworld in Spring of 2017 and is called White Lies and Wishes. I often get asked in Q&As and blog posts about my writing routine: do I write every day, what time of day do I prefer to work, where I write etc. and it struck me this morning as I looked at my to-do list that I rarely share what I do when I’m not writing. By ‘writing’ I mean being immersed in the first draft of a new book. For me this is a frenetic, intense time when I wear a permanently dazed expression and am often to be found muttering dialogue between two characters at mealtimes. In this stage I have a very strict routine, set word counts for myself and am usually working to a deadline set by my publisher. But once I have delivered the manuscript to my editor that routine falls away and whilst I’m still usually very busy, there is a less crazy look to my hair /outfits /desk /entire house and my workload looks different too. Introducing Conditional Love by Cathy Bramley! What surprises might life have in store? Find out with Cathy Bramley’s totally charming modern love story, Conditional Love, which is out today in paperback and ebook. Pop along to wish Cathy a happy publication day on Twitter and Facebook, or visit her website for more information. To celebrate the publication of Wickham Hall Part Three: Sparks Fly by Cathy Bramley tomorrow (there’s still time to read parts one and two before the new installment arrives), we have this adorable Lord and Lady of the Manor pillowcase and mug set to giveaway. Printed by The Wall Sticker Company, which custom designs gifts and homewares, we’re pretty sure Lord and Lady Fortescue would approve. To win, have a read of this short excerpt and then scroll down to find out how you can enter. 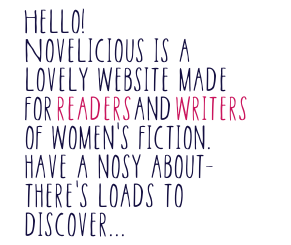 Welcome to the Novelicious Book Club – a fun and friendly digital get together where we geek out over brilliant reads. There’s nothing better than having a group of pals reading the same book at the same time, we reckon. You can lament over sudden plot twists and subsequent 4am reading sessions, swoon and whoop together when the hero and the heroine finally get together, and have lively, thoughtful discussions once you’ve turned the last page. With wine. And snacks. This month, we’re off to the lovely Cumbria countryside for cake and plenty of rustic adventure with Appleby Farm by Cathy Bramley. What happens when you send bestselling A Parcel for Anna Browne author Miranda Dickinson to interview bestselling Appleby Farm author Cathy Bramley? Lots of thoughtful and intriguing chat about writing and women’s fiction is what. Goes down a treat with a cup of tea! Miranda: Cathy, I’ve been a huge fan of your work since I read Conditional Love. How do you feel about everything that has happened to you as a writer since you wrote and self-published your first novel? Cathy: Overwhelmed, blessed and totally thrilled! I am genuinely blown away by what has happened in my writing career since getting ready to self-publish Conditional Love two years ago. I had the idea of writing one book as a challenge – just to see if I could. Even before I’d got to the end of the first draft I’d got ideas for two more. Then I began to realise that this was the new direction I’d been searching for. I’m so happy that I took a chance on writing that first novel. Miranda: Are you writing full-time now or do you still have a day job? Cathy: I’ve been writing full-time for a year now. I’d run my own PR and Marketing agency for 19 years and had known for a while that I needed a change. I gradually reduced the size of my business until it was just me and one other Account Manager, then I gave her the clients to look after and became a full-time writer. The thing with writing is that it’s not just about writing the book; marketing and promoting your work takes up a lot of time too. I am lucky that my contract with Transworld allows me to focus solely on being an author because just doing that is a seven day a week job! I love the show Come Dine With Me; it’s the perfect accompaniment to tackling the ironing pile. I can chuckle away at over-powering guests and disasters in the kitchen and hardly even notice the mountain of shirts which need doing. Novelicious have asked me to come up with my own literary edition, so I get to choose pick which authors I’d like to have round for dinner at my house. Because we like to give you the full sensory experience here at Novelicious, we have one afternoon tea hamper, complete with specially made apple crumble flapjacks, to give away to celebrate the launch of Appleby Farm by Cathy Bramley. Baked goods feature heavily in Appleby Farm. There’s homemade bread smothered in real, creamy butter; sumptuous scones made from an old family recipe and huge, crunchy, chewy pistachio meringues. Who better to provide a competition prize then than our friends at the Devon-based food emporium Delimann? One lucky winner will receive one of Delimann’s award-winning hampers, delivered right to their door and absolutely brimming with freshly baked goodies to munch on while enjoying the book. There will be apple crumble flapjacks, an assortment of freshly baked scones, jams, clotted cream, tea and even a beautiful ‘Baked With Love’ serving platter. We’ve a feeling Freya Moorcroft and Aunty Sue would approve.